to become a conscious soul-directed human being. 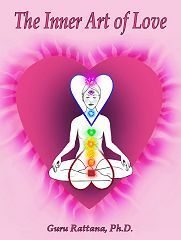 identifies and explains how to work with the basic universal energies that make up your very being. deepens your understanding of the energetic human anatomy. offers an easy to understand method for identifying the blueprint of your soul using your birthchart. (Astrology made simple and accessible to everyone). This manual guides you inward towards your personal experience of wholeness, self-love and inner peace. It directs your inner journey, using kriyas and meditations taken from her classic Kundalini Yoga manuals. Instead of new sets, Guru Rattana offers you a wealth of knowledge which will serve to deepen your personal practice of all kriyas and meditations and, for teachers, will embellish and enhance your teaching skills. Awaken Your Heart with Kundalini Yoga! The Inner Art of Love is a treasure chest of insights, instructions and wisdom which can guide you on your inner journey to your heart. Although Guru Rattana focuses on the technology of Kundalini Yoga and Meditation, her wise counsel supports all spiritual practitioners in finding and authentic relationship with their Soul and the Divine. One of the unique contributions of this manual is to offer a simple formula using astrology to identify the energetic blueprint of your soul. With a clear and concise explanation of the basic universal energies and archetypes that we all embody, she explains how you too can discover and develop your unique gifts and make your special contribution to the world.